Do You Know About The Battery Types? Five Of The Best Motorcycle Boots Reviews You Should Have! You will soon learn how to maintain your motorcycle’s battery and electrical system once you start riding. Like all bikers, Harley owners depend on their machine to get them through a good day of riding. To avoid breakdowns and operating failures, you will want your bike to be equipped well and ready to run at all times. When it comes to cranking your starter and powering everything on demand, only the best batteries can give you peace of mind on the road. Today’s typical motorcycle battery is a sealed and maintenance-free unit that is spill-proof and therefore won’t ever need refilling with water. Most come from the factory ‘activated’, meaning they fully charged and ready for installation. With the latest AGM designs, battery acids are absorbed in special plates and distributed in glass mats to attain greater performance and durability. Modern batteries don’t require much physical maintenance compared to older designs, but their charge is best kept topped-up as much as possible. The best Harley battery reviews cover these operating aspects along with cold cranking amperage (CCA) capacity and build quality. We’ve reviewed here a few models that excel in these features. Sealed lead-acid battery packs of wet-cell (flooded) design used to represent the majority of batteries mounted in motorcycles. Battery packs are groups of cells connected to each other inside a common housing, with each supplying some 2.1-2.2 Volts of DC current, for a nominal rating of 12 Volts in total. Newer absorbent glass mat (AGM) lead-acid designs differ from flooded types, as their electrolytes are stored in mats instead of freely flowing through internal plates. These are built differently, with minute glass fiber material woven into very fine matting that’s inserted between each plate. As the fibers are tightly packaged, the entire pack is less prone to transmitted vibration and shock damage. You will find that it helps to understand the different batteries types in order to figure out how to maintain your bike’s model more effectively. AGM batteries can better resist shocks and vibrations due to their robust internals. As their mats are not fully saturated with electrolytic fluid, the latter cannot expand enough to damage the plates and casing during freezing conditions. Your frequency of riding determines how long your pack will last for batteries tend to stay more fully charged if they’re in constant use. Packs that lie unused for extended periods without occasional top-ups or operation will undergo sulfation, which diminishes power capacity and performance over time. If the cells ever deplete fully then damage will ensue, after which they may no longer be able to hold their rated full charges. It’s actually better for the battery if you continually ride, so that it is constantly being charged by your bike’s electrical system and will rarely run down. If you ride far less during cold seasons, then you can expect the pack to lose its charge slowly over time. You can maintain your unit’s rated capacity in such times by ensuring it does not fully drain, using battery tenders to keep it charging smartly. These devices are much like standard chargers except that they are kept in continuous operation, even when you aren’t rolling around. Here is a short list of four highly rated models, along with details on each one’s strengths and issues. This model has a sturdy heat-sealed cover and offers cranking amperage equal to or in excess of your original battery’s specs. The pack comes fully charged and ready for installation in a variety of compatible Harley models. It is designed with mostly the same size casing and power rating as the OEM batteries, at 400 CCA and 26 AH. It should fit well in place of the original, readily swapping in for immediate use as soon as it’s installed. With its standard dimensions, it’s a direct replacement for OEM part numbers 66010-97A, 66010-97B, and 66010-97C, which should fit these Harley-Davidson motorcycle models: Electra Glide 1997-2016, Road Glide 1998-2016, Road King 1997-2016, Street Glide 2006-2016, Tri Glide 2009-2016, Ultra Classic 1997-2016. As this model is manufactured in the same OEM factory, it is all but guaranteed to work with your bike. In short, the ThrottleX HDX30L with its quality construction and good performance is our pick for an affordable and durable 400 CCA battery for your Harley. Rated at 32 AH and 500 CCA, this model is one of the most reliable on the market. Its advanced lead-calcium formulation enables it to be charged in an hour or less, faster than conventional types. It can also maintain its fluid specific gravity for thrice as long, and thus typically holds its charge longer in comparison to others. Among the largest-capacity AGM models available that can fit right into Harleys, Yuasas are the OEM choice of most motorcycle brands and for a good reason. With its higher starting amperage rating, this battery cranks more rapidly than stock units can, helping your bike’s starter to last longer as a result. It’s a particularly good replacement choice for big-engine bikes or those with comparably high-compression motors. We would recommend this model to owners of Touring bikes for its great performance. It helps that the casing is designed to fit most Harleys without further modification or need of adapters. Overall, the Yuasa GYZ32HL with its high 500 CCA is the most dependable and capacious AGM battery and probably the best all-around, especially touring bikes. 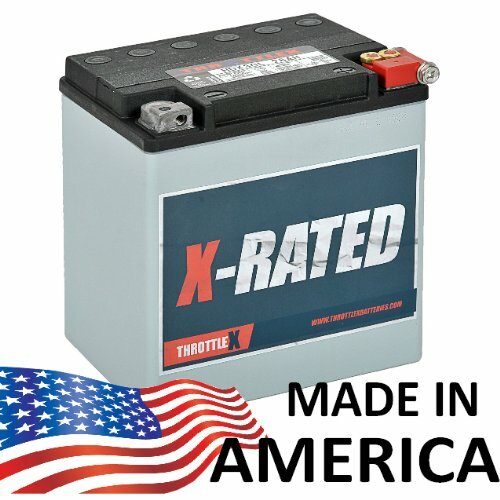 From the same manufacturer of Harley-Davison’s batteries, this is an inexpensive yet good option, coming as it does from a reputable factory. With its 400 CCA 28 AH rating and good blend of quality features and construction, the pack is built to resist extreme temperatures and severe vibrations. It features durable molded side and top connecting terminals for more versatility and stable operation. The pack recharges quicker than most other comparable models. It’s designed to provide performance equal to or better than your bike’s original battery, with the ability to crank strongly as well power additional lights and other accessories. Deka is a well-regarded brand who also manufactures Harley-Davidson’s original battery packs, and their models are a natural fit for most Harley models, particularly Electra Glides and Street Glides. 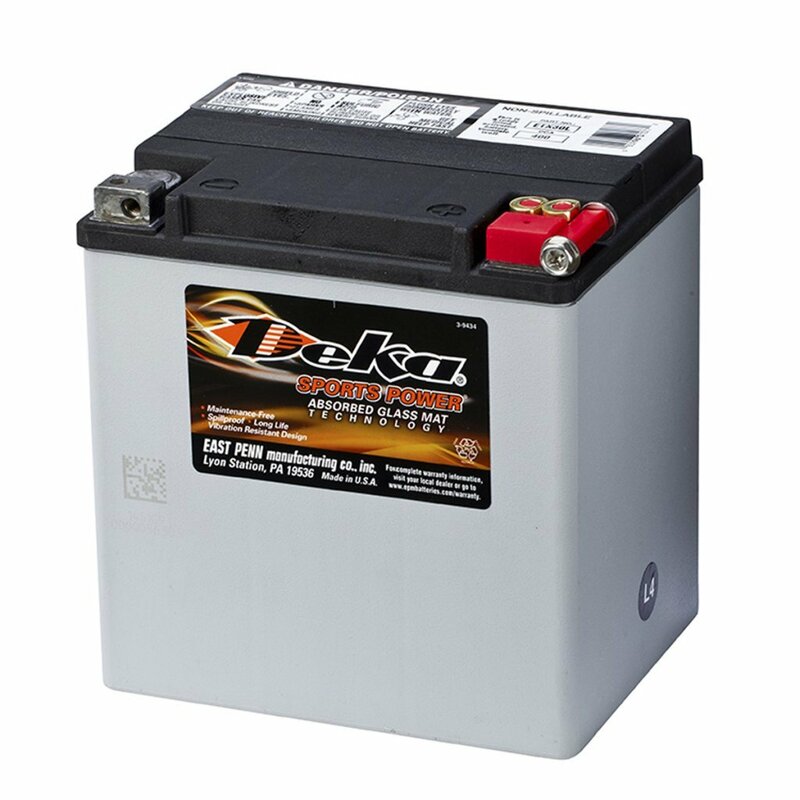 The Deka Sports Power ETX-30L is a quality battery with 400 CCA capacity that sells at an affordable price. This is a very affordable AGM battery although its 365 CCA 26 AH rating is slightly lower than most. But it is well built and has molded side and top connecting terminals for greater versatility and stability. With its standard dimensions, it can directly replace OEM part numbers 66010-97A, 66010-97B, UBVT-2, YIX30L, YB30CL-B, YB30L-B, and equivalents. It should fit most Harley Davidson models, including Electra Glides and Road Kings. Since this model can fit a variety of power sports vehicles, it accommodates both top mounting and the cable side positioning of Harley bikes. The included spacers will let you adapt it for a good fit, and like the other models it is supplied factory activated for immediate use. However, some riders have reported that it doesn’t tolerate the coldest long winters too well, even with constant use of smart battery tenders and chargers. But if you live and ride about in sunnier country, it should deliver dependable performance for all but the biggest and most loaded touring bikes. 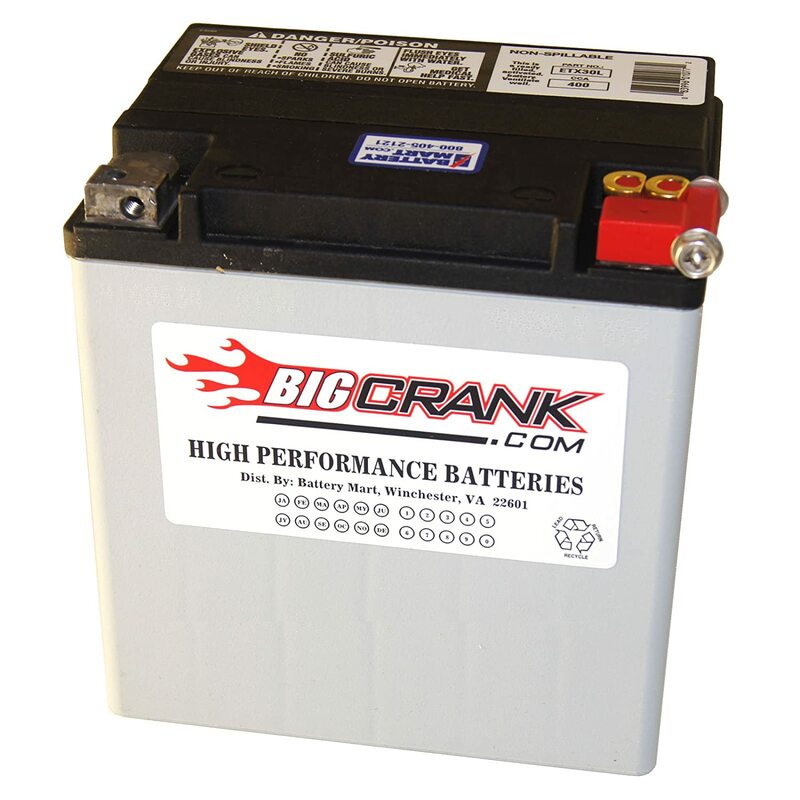 With its decent cranking power and very low price, the Big Crank ETX30L is our choice for the best inexpensive battery for owners of regular Harleys in warmer climes. Manufacturers claim that regular batteries should last for two years on average. Most bikers are satisfied with getting an extra year or two of use over that. It’s a fact that untimely failures are mostly due to bad maintenance or operation in very cold weather, and you should look for highly rated models that can better endure harsh and constant use in such conditions. 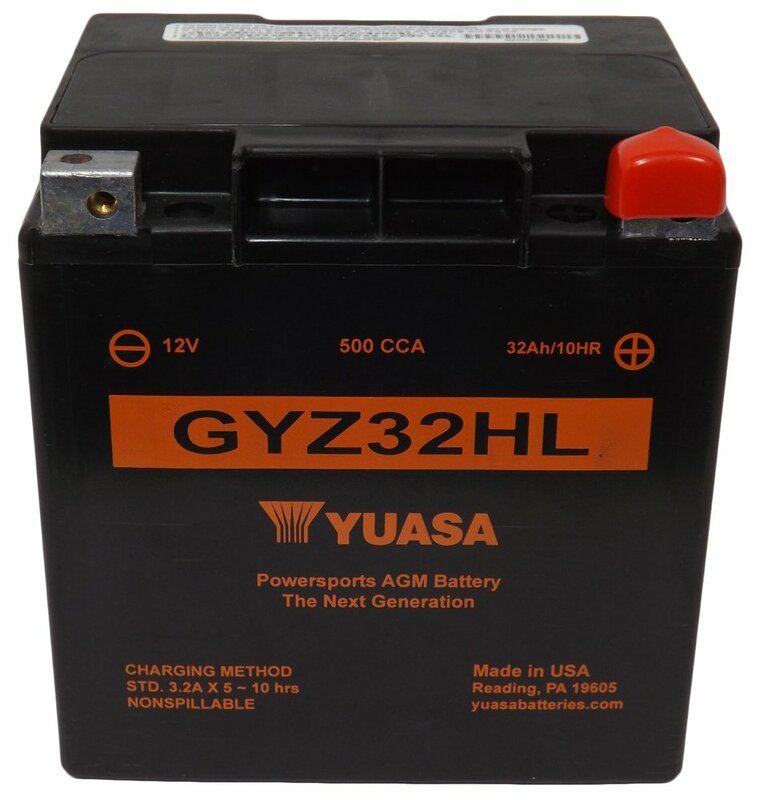 We believe that the new Yuasa GYZ batteries are more dependable overall than other maintenance-free sealed models. With its class-leading 500 CCA capacity and quality USA construction, it’s the best all-around battery pack you can find for your Harley. In any case, always choose the battery with the best CCA ratings and endurance that you can afford. We hope that this look at the best Harley battery reviews here will get you started in more ways than one! If you enjoyed what you’ve just read, feel free to leave a comment. Do let us know what you think of this guide to Harley motorcycle batteries. Over the past 10 years, Lucas Knight has been a motorcycle rider. He has built up an incredible passion for travelling by motorbike and always wishes to contribute to motorcyclist community. This is the reason why he created MotorManner.com where his passion is turned into useful and interesting information to the motorcycle lover. Follow his facebook and twitter or subcribe to his website to receive more useful information in motorcycle world.